The Trust for Public Land invites you to join us for our 2014 Gala to be held in New York on Wednesday, October 15th. At our second annual Gala, we are proud to honor Michael J. Kowalski and The Tiffany & Co. Foundation for their commitment to the environment, in particular their work to improve and enhance urban parks in New York and around the world. As a leading funder in our Campaign to Save Cahuenga Peak in Los Angeles, they helped to permanently protect 138 acres of pristine, wild land adjacent to the world famous Hollywood Sign. Our Co-Chairs of the event are our National Board Directors George Bell, Page Cowles, Douglas Durst and Caroline Niemczyk and New York Advisory Board members Emanuel Stern and Lisa Sarajian. We would be delighted if you would take part in this quintessential New York evening. For more than forty years, The Trust for Public Land has conserved land for people to enjoy as parks, gardens, and other natural places, ensuring livable communities for generations to come. With a leadership team that includes Adrian Benepe, former NYC Parks Commissioner, we have become the nation’s leader in creating urban parks and other green spaces where children and their families can play and connect with nature. Our work in New York City has included the design and construction of nearly 200 playgrounds, saving 70 community gardens from development, and the creation or expansion of numerous city parks and open space. We are also at the forefront of the current debate on how to address the looming climate crisis with a three-pronged conservation program to help reduce greenhouse gasses, promote climate adaptation, and create park-rich, climate-smart, and sustainable cities. The 2014 Gala will celebrate The Trust for Public Land’s more than four decades of achievement and will help to ensure our ability to continue to preserve open space, create city parks and conserve land for people. We look forward to having you join us on October 15th! Thousands of New York City children do not have access to a close to home park or playground. In fact, 73 percent of the city’s low-income neighborhoods fail to meet the city’s standard of 2.5 acres of parkland per 1,000 residents. In these communities, many of the schools have no playground facilities at all. This scarcity of outdoor play opportunities contributes to high rates of childhood obesity, diabetes, asthma, and other health problems. Since 1996, The Trust for Public Land has helped design and build more than 176 playgrounds in New York City public schools. We transform barren asphalt lots into vibrant playgrounds with safe and durable play equipment, athletic facilities, gardens, and opportunities for environmental education. Our partnership with New York City has resulted in more than 150 acres of additional playground space serving 380,000 children and their families. The cornerstone of our program is a three-month participatory design process. Involving students, parents, school staff, and neighbors helps us create playgrounds that communities care about—and that meet each neighborhood’s unique needs. When well-designed, playgrounds are a cost-effective approach to improving air quality, cooling the city, and protecting vital waterways. 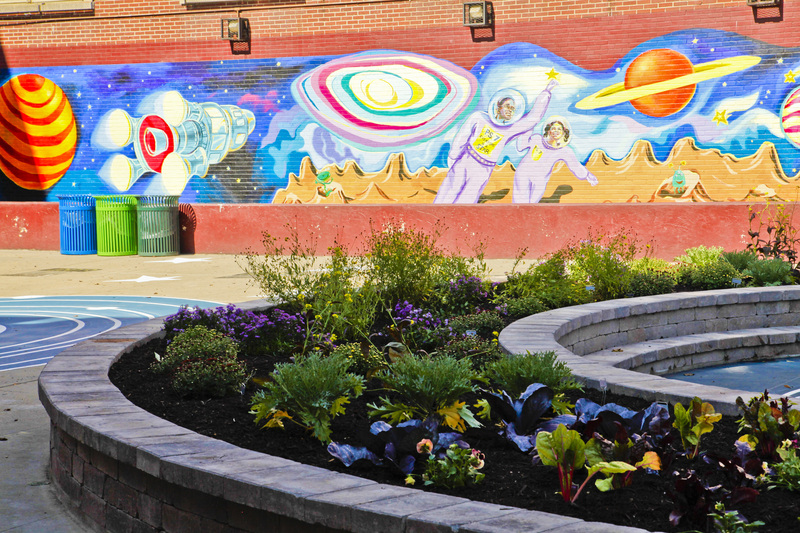 We equip our playgrounds with green infrastructure elements—such as rain gardens, porous paving material, and specially selected plantings—that reduce excess stormwater and sewer overflows that pollute New York City’s rivers and harbor. In the next three years, we’ll be working with the city’s Department of Environmental Protection, the School Construction Authority, the New York City Council, and private funders to build new playgrounds in priority watersheds including Newton Creek, Gowanus Canal, and Jamaica Bay.